A Taste of Italy’s Country Cuisine! La Nonna, meaning “The Grandmother” in Italian, serves traditional Italian country cuisine, much like what grandma would usually prepare in an unpretentious and inviting Trattoria atmosphere. La Nonna was created to capture the soul of authentic Italian cooking, time-honored recipes passed down from the Italian Grandmother. The first outlet La Nonna opened its doors in November 2006 without much fanfare but gradually accrued a loyal following among enthusiasts looking for understated comfort good food served with warm Italian hospitality. La Nonna paints the picture of Italian country side with a modern touch, with its traditional bronze oven, deep wood decor, taupe-coloured walls adorned with vintage Italian posters and shelves prepared with antique lamps and old wine bottles, reminiscent of the warmth of Grandma’s proudly-owned house. La Nonna is not just great for cosy gatherings amongst friends and family, its soft lighting also perfect for a romantic date. Make your reservation today to avoid disappointment. 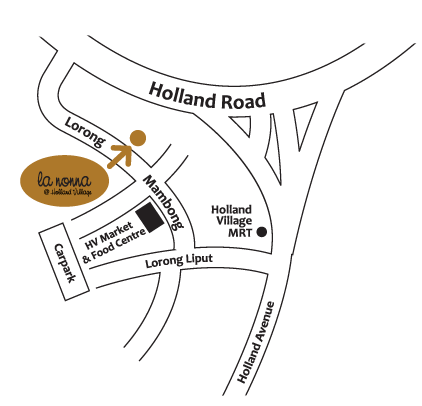 Call 6468 1982 (Holland Village) to book your seat and dine with us! Unpretentious Italian cuisine though simple in its cooking and presentation, the food stands out for its remarkable Tuscan flavor, typical of Grandma’s cooking. Dig in to a hearty list of traditional dishes in our ala carte menu and Chef Specials, updated regularly according to the European season. An assortment of Pork, Beef, Chicken and Lamb sausages. Check with our team if you are craving for a typical, old-style Tomato, Arrabbiata, Carbonara or Aglio e Olio sauce; our Chef will be glad to whip it up! Romaine Lettuce Salad with boiled Egg, crispy Bacon, shaved Parmesan Cheese and Bread Croutons in Anchovy dressing. Mesclun salad with Red Chicory Lettuce, Parma Ham, Mango, Baby Radish, Cherry Tomatoes and Black Olives in White Wine Vinegar dressing. Braised Lamb Shank with Lemon, Rosemary, Mint, mashed Potatoes and roasted Carrots. Prices quoted above are subject to 10% service charge and 7% GST. Unwind with a bottle (750ml) of Prosecco at only $35++ (U.P. $58++) with a complimentary side of assorted Italian Sausages, Bruschetta or Calamari! Alternatively, grab a full pint of Draught Beer at just $10++ or a glass of Wine for $8++ (U.P. $14++) with your friends. Enjoy home-cooked Grandma’s Favourite Italian dishes right at home! Choose from our selection of appetizers, salads, pastas, pizzas, mains and more. Place your delivery orders with Honest Bee and Deliveroo. Indulge in a complete 3-course Set Lunch Menu at $26++, served with gourmet Coffee or Tea. **Available from Monday – Friday, 12.00pm – 2.30pm, except eves of/ and Public Holidays. 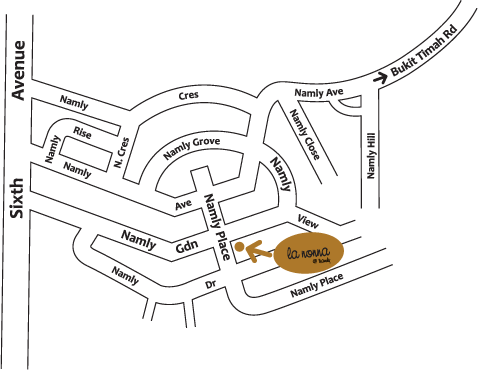 Alternatively, enjoy 1-for-1 pizza/ pasta/ main** at La Nonna. **T&C: Every diner is required to have at least 1 pizza, pasta or main (with or inclusive of complimentary items). For a limited period only, 1-for-1 Lunch Promo is available from Monday to Saturday, 12..00pm – 2.30pm, except eves of/ and Public Holidays. Perfect for a cosy gathering among friends and family, bask in the ineffable rustic charm of our Private dining room at Holland Village and have a good hearty Italian meal with good company. Bespoke set menus are available upon request for your private dinners, birthday parties, corporate dinners, or even wild hens night parties! Please email info@lanonna.sg for your event enquiries. Reserve your table Online HERE!